De Asis Shocks Buenavista in MILO-Tarlac | JustRunLah! TARLAC CITY – Jujet de Asis shocked running legend Eduardo “Vertek” Buenavista in winning the 41st National MILO Marathon qualifying race Sunday morning (August 13) at the Maria Cristina Park. It was a tight race that was decided in the final stretch. De Asis finished the 21-kilometer course in 1:14:33, a good 16 seconds faster than the five-time MILO King Buenavista who checked in at 1:14:49. Third Place went to Jomar Angus with a time of 1:16:07. Meanwhile in the Women’s Division, Shane Acosta finally ended years of frustration with her first championship in a clocking of 1:44:00 to ease out Angielyn Pablo (1:49:54) and Maricar Gammad (1:51:48). 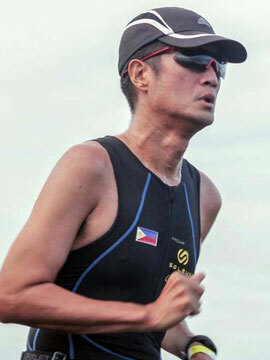 Acosta started racing 21 kilometers in 2014 and settled for runner-up finishes after winning the 2013 Tarlac 10-kilometer category. Others who went home victorious that morning were Philip John Gongob (36:49) and Merry Joy Trupa (40:09) for 10 kilometers, Mitch Fulgado (17:27) and Maria Angelica Yabo (24:24) for five kilometers and Jericho Tacutaco (11:50) and Joana Marie Gagarin (14:25) in the three-kilometer kiddie race. The MILO Marathon will take a brief break this week and resume its search for the best runners with another regional qualifier in Naga City on August 27. It will be followed by more races in the cities of Lucena (September 3) and Lipa (September 10) before moving over to the Visayas and Mindanao. This year’s National Finals will be hosted by Cebu City on December 3. A cash windfall of PHP 300,000.00 awaits the grand winner plus the chance to represent the country in an international race in 2018. In May of this year, reigning MILO King Jeson Agravante and MILO Queen Mary Joy Tabal were sent to the ScotiaBank Ottawa Marathon in Canada. Tabal won top honors in the 21-kilometer category in the process setting a new Philippine record for the distance in 1:16:27.